Pot-grown plants with leafy new growth need a gradual introduction to direct sun and wind before planting. Set plants outdoors in a sheltered, lightly shaded spot, increasing their exposure to sun and wind each day. After 7–10 days, they’ll be ready to go in the ground. Before planting, check the potting mix in the pot and water thoroughly if it’s dry. Dig a hole slightly larger than the pot. Remove the plant from the pot by grasping the rim, turning the pot upside down, and tapping it against the heel of your hand. 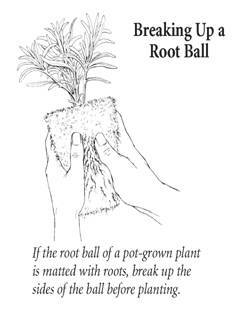 If the plant is root-bound (the root ball matted with roots to the point that they obscure the potting mix), gently break up the sides of the ball with your thumbs (see drawing below) and tease apart roots that are circling at the bottom. This encourages roots to grow into the surrounding soil. Set the root ball in the hole so that the top of the ball is level with the surface of the soil. Then push soil around and just over the top of the root ball, firm the soil, and give the plant a thorough soaking to settle the soil. Unwrap the perennial just before you’re ready to plant, being careful not to expose the roots to the air for any length of time or they may dry out. Dig a hole wide enough to accommodate the spread of the roots and deep enough to allow you to set the crown—the point where the leaves or stems of the plant meet the roots—1in below the surface of the soil. (Some plants require deeper planting, others shallower planting—see the White Flower Farm plant label.) 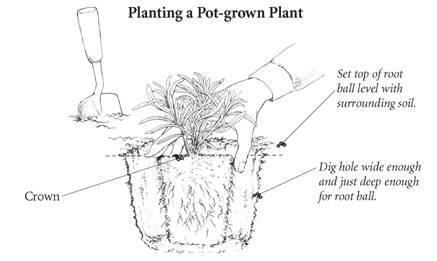 Place the roots in the planting hole and arrange them in whatever fashion appears natural. Holding the crown of the plant, push soil into the hole, working soil around the roots. Firm the soil around the crown, pressing down with both hands. Water thoroughly, even if rain threatens, to settle the soil. It’s not always easy to tell which end of a bareroot perennial is up. Some perennials—Ferns and Liatris are good examples—may lack obvious roots. Look for buds or the remains of stems and leaves, and plant them facing up. When in doubt, lay the crown on its side; the plant knows to send shoots up and roots down.